Ladies, I’ve got a new challenge for you (okay, men can do this challenge as well)! Over the course of the next month, I want you to be able to perform 100 non-stop bodyweight back extensions. Like my other challenges, this isn’t for complete beginners, so make sure you have some training experience. This isn’t meant to replace your normal training program; it’s just a supplement. If your normal workout includes back extensions, take them out since you’ll be performing 12 sessions of them with bodyweight this month. The first day should be fairly easy…most folks can achieve 20-back extensions pretty easily. If one of the challenge days falls on one of your normal training days, then perform the challenge after your normal training session. See the schedule below. You’ll note that there are three challenge days per week for the first three weeks, two on the fourth week, with the fifth week being the 100 rep challenge. The frequency of challenge days per week decreases as the number of reps per set goes up. If you find it difficult to maintain the pace of the challenge, ease up slightly on the volume of your normal lower body training as the month progresses, and possibly perform the challenge first if it falls on normal training days. As far as cadence is concerned, you want to be performing the back extensions explosively, but don’t rush. No resting in between reps though – you will perform the entire set in a continuous fashion. If a challenge day lines up with an upper body training day, still do the challenge at the end of your workout, just make sure you do a few lower body drills to warm up beforehand, including a warm-up set of 10 bodyweight back extensions. Click on the picture to enlarge it. Remember, although this is a challenge, don’t be foolish and train through pain. If something doesn’t feel right, don’t complete the challenge And if you’re currently performing Strong Curves or Get Glutes, just stick with the plan! 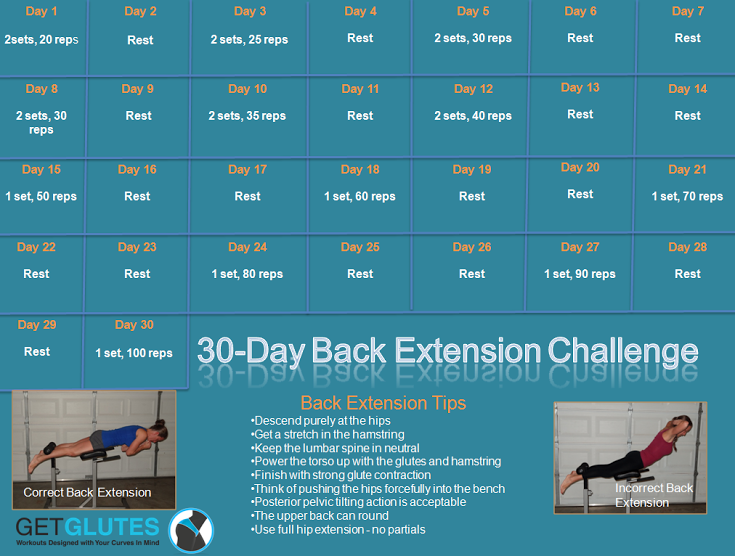 The post 100-Rep Back Extension Challenge appeared first on Bret Contreras.